In the next TGA, we will provide the Table of Contents from all of the issues of The Massachusetts Magazine. While researching this publication, we found other magazines of the time, some of which are still being published (we will add Harper's Bazaar to the list). 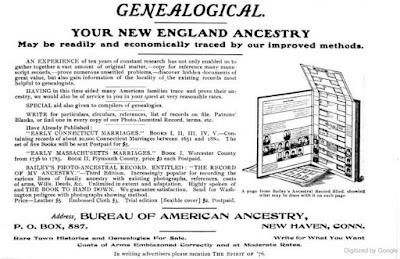 In many cases, there were members of the extended families involved. 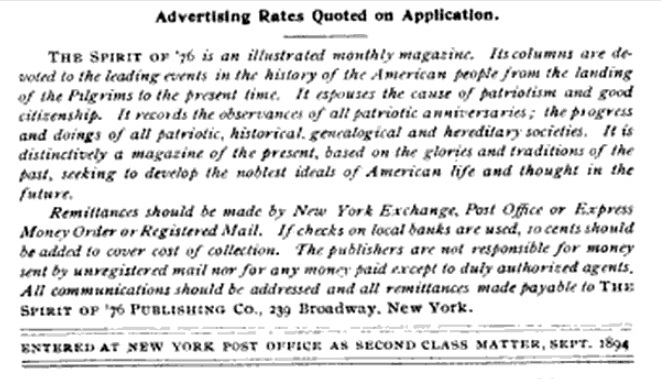 The last issue of the TMM was in 1918. I just became aware that an aunt (in-law) had a copy of a book in which Dr. Frank published some of his ancestry. The year was 1907 which was when he published the first book on Thomas Gardner, Planter. The book was published by F. W. Bailey, who authored several books. He also worked out a format for a book that could be a keepsake. Upon looking up F. W. Bailey, I found that he had advertised in the Spirit of '76. What was the Spirit of '76? 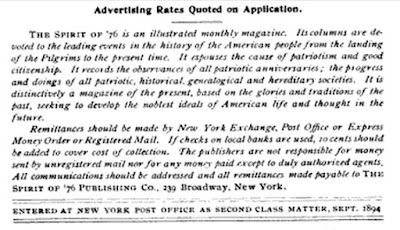 It was a magazine started, in New York, in 1894. It published until 1906; there are digitized copies of the issues which published monthly. This is the banner for the magazine. 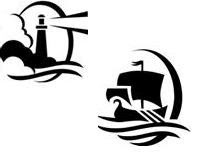 Its scope included the "history of the American People from the landing of the Pilgrims to the present time." Of note is that it was the voice for several organizations including S.A.R., but the finances were never quite right. D.A.R. started its The American Heritage about the same time and published until 2001. On browsing several issues, the Spirit of '76 covered the same material as did the magazine started by Dr. Frank and friends. So, expect more on this. 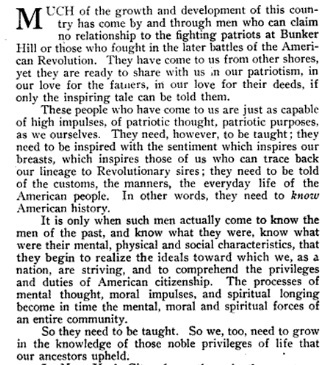 Let's end with a little from an article in the Oct of 1903 issue. Lots to discuss, but the topic very much applies today. Some information about the periodical is available in the book by W.E. Davies titled Patriotism on Parade: The Story of Veterans' and hereditary organizations, published by Harvard in 1955. Yearly, in D.C., the Hereditary Society Community, which is a collection of societies whose theme is herediatary, meets over a two week period. We will have more on that. 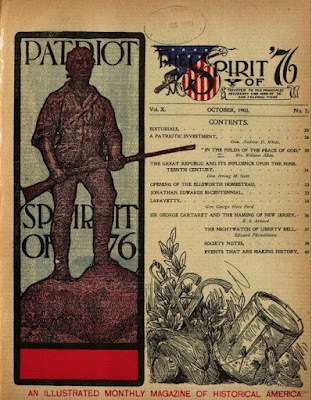 04/03/2018 -- We will be looking more closely at "The Spirit of '76" as a magazine (its time, format, and operational issues) and as a repository of information; as well, we will look further at the work of F.W. Bailey who compiled works on the early marriage of Connecticut and Worcester, MA. In his 1st Volume of Massachusetts marriages - Worcester (1897), F.W. 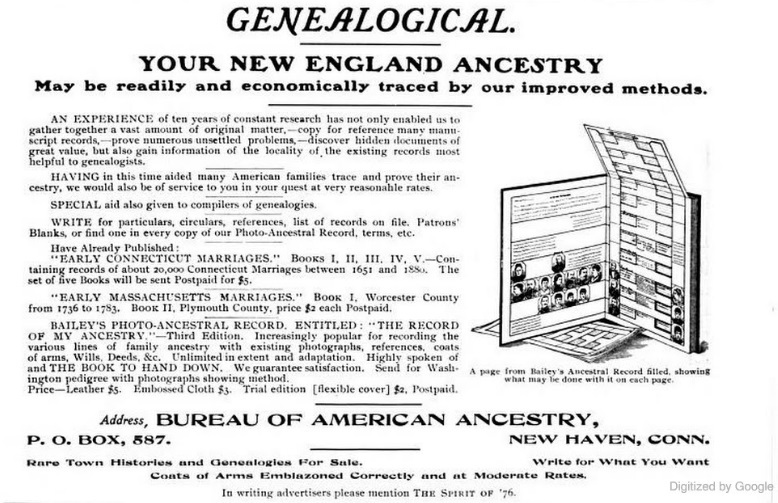 appended a two-page ad about his work and the ancestral record: Special Word and Greeting. Some families submitted their books to the Library of Congress. F.W. 's page on George Washington (TSo76 -1898). History. Looking at the magazines of 1890s and their illustrations, one's mind goes to the linotype: Linotype machine, The Year That Defined American Journalism: 1897 ... Personally, I remember the Linotype in use plus the early days of Phototypesetting through the days and versions of desktop publishing as it evolved. I might add, not as a printer, but as content provider, editor, and worry wart on getting the thing out on deadline. 05/21/2018 -- The information from the 1907 and the 2010 sources agree. We can now fill in Dr. Frank's maternal information: 1907 chart.